A great way to identify that black suitcase as it comes towards you on the baggage carousel. These brightly colored leather luggage tags will buckle securely to the handle of your luggage and make it very easy to identify. One side is solid leather, the other side has a dark mesh covering the address information which will make it hard for someone to read the address from a distance. Available in royal blue or deep red with a chrome buckle. 7 3/4 in. x 2 1/2 in. 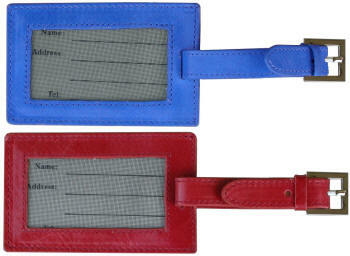 leather luggage tag in red or royal blue. One side is solid leather, other side has dark mesh covering the address information. Chrome buckle.